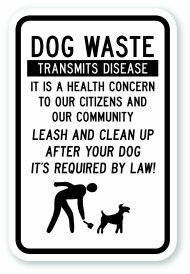 Insuring extended sign life, "Dog Waste Transmits Disease It's A Health Concern" is made from Heavy Duty .080 18" x 12" Aluminum for pole mounting or Standard Duty .040 Sign for fence or wall mounting. All signs come with Standard 3/8" Mounting Holes centered Top and Bottom. Available in your choice of RED, BLUE, BLACK or GREEN on white background. Each has a reflective sign face option achieved by applying 3M HIP reflective material.